The group of hackers known as China 1937CN Team compromised the announcement screen systems at many major airports in Vietnam. According to the 2015 version of the ‘Transportation Systems Sector-Specific Plan’ the transportation industry is increasingly exposed to cyber threats. The sector is becoming a privileged target of hackers worldwide, the last incident in order of time occurred in Vietnam where a group of Chinese hackers has attacked the digital signage system causing serious problems with the infrastructure. At the Tan Son Nhat International Airport, the attacker abused of the loudspeaker system to spread offensive messages in English. Another airport, the Da Nang International Airport experienced repeated glitches at its computer system. The authorities reported other problems in the country, for example, airlines at 21 airports across Vietnam have had to switch to manual processes to complete check-in procedures for passengers. Many flights had significant delays because the shutdown of check-in counters. Some airlines shut down some check-in counters completely—leading to flight delays. “A team of self-proclaimed Chinese hacker has compromised the announcement screen systems at many major airports in Vietnam, and hacked the website of the country’s national flag carrier, the Ministry of Transport confirmed on Friday.” reported the Tuoi Tre News. Some local security experts also posted on their Facebook pages some photos showing that the VIP passenger section on the website of Vietnam Airlines had also been hacked and defaced. 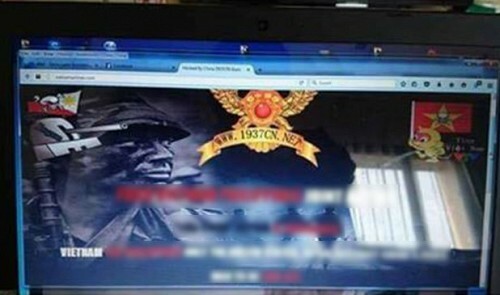 The screenshot posted online shows that that the hacker group, calling itself China 1937CN Team, sent “a warning message” for Vietnam and the Philippines. A source told the news outlet that personal data of some 411,000 passengers had been exposed. This isn’t the first time that the China 1937CN Team hit the Vietnam, in May 2015 the same group hacked roughly 1,000 Vietnamese websites, including 15 government portals and 50 education sites. In the same period, around 200 websites in the Philippines were attacked by the China 1937CN Team hackers. Many Vietnamese security agencies and private firms have joined hands to support the Vietnam Airlines and protect their assets from the attacks of groups of hackers like the China 1937CN Team. “Vietnam Airlines said it has deployed back-up plans to ensure safety and operations at airports.” continues the post.